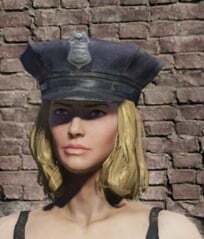 Cop Cap is Head Armor in Fallout 76. Cop Cap weights 0.5 and can be found after level ??. All armor pieces provide protection against physical and energy damage, as well as radiation. In Fallout 76, The amount of mitigation provided depends on the level of the piece. This armor has no special effects. Items in Fallout 76 are able to be leveled up. The table shows the values per level. Please see Damage Types for explanation of each possible damage source. You can find this outfit in Morgantown, Responder tent. Or Tyler Country Fairgrounds, Throw and Bowl locker in the back. This item can be clean or dirty.